The enduring popularity of King Kong doubtlessly has something to do with the sheer grandeur of the character. He's a 100-foot-tall ape. That's a concept both wondrous and scary. Toss in the fact that he's famously attracted to beautiful blonde women and you get another compelling factor. Sure, the beast is capable of destruction and mayhem, but he's got a heart, too. The extremely entertaining Kong: Skull Island brings the character back to the screen in a slightly different manner. There's no Empire State Building here, just a terrifying jungle where a bunch of humans find themselves trapped. The story concerns a group of individuals setting a course for an uncharted island. They are led by Bill Randa (John Goodman), the man who discovered the island's existence on a weather map. With him are geologist Houston Brooks (Corey Hawkins), photojournalist Mason Weaver (Brie Larson), and professional tracker James Conrad (Tom Hiddleston). Providing transportation and security is an Army unit, commanded by Preston Packard (Samuel L. Jackson). Immediately upon reaching the island, they encounter Kong, who smashes all their helicopters. The group only has three days to make it to the planned extraction point. 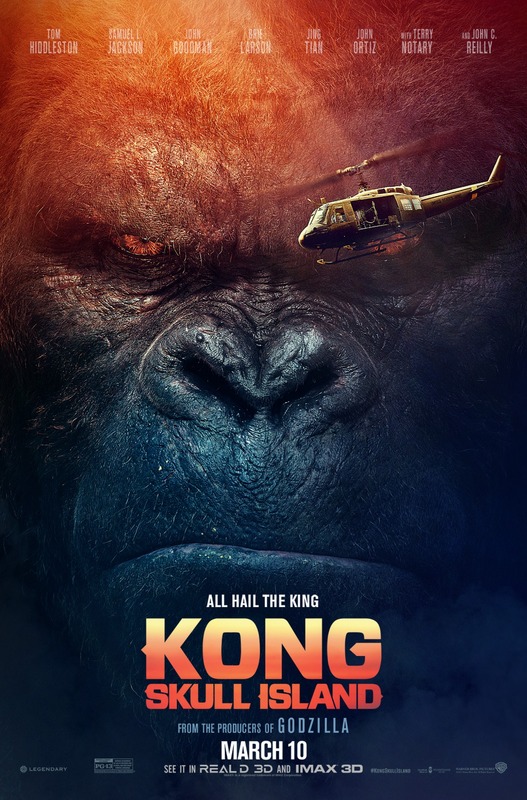 Their journey to this destination causes them to cross paths with Hank Marlow (John C. Reilly), a WWII soldier who's been stranded on Skull Island since 1944, as well as an assortment of gigantic creatures that might eat them. The original 1933 King Kong and the 2005 Peter Jackson remake both have a strong emotional core. Kong falls in love with Ann Darrow (as played, respectively, by Fay Wray and Naomi Watts), gets taken against his will to New York, and ultimately falls off the Empire State Building in an example of “beauty killing the beast.” Kong: Skull Island opts to skip that emotional content. In some respects, the decision is a bit disappointing. Nevertheless, the movie's favored approach – to just be a really good, no-holds-barred action movie – proves quite successful. Not only do you get a giant ape, you also get colossal squids, yaks, spiders, and lizards. Kong fights these creatures at various points throughout the story. The humans either outrun them or become lunch for them. The visual effects are outstanding, making each monster-based scene both thrilling and viscerally engaging. Superb use of 3D enhances the action. Director Jordan Vogt-Roberts (The Kings of Summer) makes extensive use of the format's pop-off-the-screen quality. Creatures lunge at the camera, and dirt flies whenever Kong smashes one of them into the ground. An authentic sense of the beasts' scope is also conveyed through the 3D. They menacingly tower over the people. Skull Island really doesn't aspire to be anything more than a fun monster movie. On that level, it is perfectly enjoyable. Much creativity has gone into conceiving the attacks and battles. When the monsters aren't onscreen, you can appreciate a wonderfully diverse cast of actors. This is one of those movies where there are so many characters that none of them really gets more than one personality trait. Packard, for instance, is a typically Samuel L. Jackson-esque no-nonsense tough guy. Even if the characters aren't as three-dimensional as the effects, the cast members bring a lot of energy to them. They're clearly having fun, which allows the audience to have fun, as well. John C. Reilly is especially good, bringing a humorous off-kilter quality to Marlow, who has clearly gone a little bonkers while stuck on the island for decades. Brie Larson is the other standout. There's one moment where Skull Island seems like it's going to go a little deeper. Mason attempts to make a small connection to Kong. The film doesn't totally follow up on it, yet Larson gives the scene real warmth, filling in what the screenplay mostly leaves blank. She's terrific, as always. King Kong purists may miss the more substantive elements of the previous Kong movies. They are what separates the whole Kong concept from other creature features – and the thing that various ripoffs over the years have failed to replicate. If you're looking for monster-on-monster or monster-on-human action, though, Kong: Skull Island is just the ticket. The movie knows precisely what it takes to deliver mayhem that makes you smile and lean in so that you can savor every awesomely chaotic second. Kong: Skull Island arrives on 3D Blu-ray combo pack, Blu-ray combo pack, and DVD on July 18. Warner Bros. Home Entertainment provided a complementary copy of the Blu-ray combo pack for this review. The supplementary material on the disc starts with a lively audio commentary from director Jordan Vogt-Roberts, who has lots of cool tidbits on the movie. Next up are a series of behind-the-scenes segments. “Creating a King: Realizing an Icon” looks at Kong's cinematic history and how the filmmakers attempted to approach the character from a new angle while still respecting his history. The follow-up, “Creating a King: Summoning a God” focuses on how modern CGI technology allowed for the creation of a more detailed, expressive Kong than any other movie has been able to provide. The complex sets and other visual effects are also touched upon. “Monarch Files 2.0” recounts the story's events in the form of a classified government film. “Tom Hiddleston: The Intrepid Traveler,” meanwhile, finds the actor hosting a look at the various locations where he filmed Kong: Skull Island. “Through the Lens: Brie Larson's Photography” is a montage of photos the actress took on set. Vogt-Roberts provides voiceover, during which he explains that he insisted Larson have a working camera throughout production so that she could shoot pictures, just as her character does. The audience wouldn't necessarily know this was the case, but it provided a bit of realism to help her feel like the photojournalist she portrays. “On Location: Vietnam,” as the name implies, examines filming Kong in the country. Finally, there are about four minutes of deleted scenes that are fun to watch, even if they don't offer anything substantial. The Kong: Skull Island bonus features are well-produced and entertaining. The extras do a terrific job of providing perspective on how the filmmakers pulled off the feat of tackling Kong in a new way. Combined with excellent sound and picture quality, this is an impressive Blu-ray release. Kong: Skull Island is rated PG-13 for intense sequences of sci-fi violence and action, and for brief strong language. The running time is 1 hour and 58 minutes.